Hamptons residents are actively engaged in their community and keeping them informed is our top-priority. 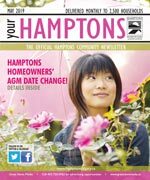 Your Hamptons is the official community newsletter, and covers community news and is published monthly to keep content current and relevant. Delivered to every household, apartment, and business, every resident is acquainted with the community’s most important information. Hamptons is somewhat unique in Calgary because, unlike in the majority of communities, its homeowners association is also the community association. The association collects a fee to enhance area maintenance, including upkeep of flower beds, and increased grass cutting, watering and weeding. The homeowners association also maintains the other community resources, including a paved Olympic size hockey rink with heated, sheltered bleachers, the adjacent kiddie rink, the tennis courts and practice court, the paved bike path system, the sports field with soccer pitches and ball diamonds, and a creative playground. This allows residents of the Hamptons access to a wide variety of recreational opportunities. In the City of Calgary’s 2012 municipal census, Hamptons had a population of 7,905 living in 2,471 dwellings, a 0.8% increase from its 2011 population of 7,843. With a land area of 3.5 km2 (1.4 sq mi), it had a population density of 2,260/km2 (5,850/sq mi) in 2012. Residents in this neighbourhood had a median household income of $125,042 in 2005, and 5.6% of its residents were within low income households. Also as of 2005, 44.9% of the residents were immigrants while, in 2006, 84.6% of occupied private dwellings were single detached homes, and only 2.3% of all occupied private dwellings were rented. For more detailed info visit the City of Calgary community profiles site.